The role of type I IFN signaling in CD8 T cells was analyzed in an adoptive transfer model using P14 TCR transgenic CD8 T cells specific for lymphocytic choriomeningitis virus (LCMV) but deficient in type I IFNR. In the present study, we demonstrate severe impairment in the capacity of P14 T cells lacking type I IFNR to expand in normal type I IFNR wild-type C57BL/6 hosts after LCMV infection. In contrast, following infection of recipient mice with recombinant vaccinia virus expressing LCMV glycoprotein, P14 T cell expansion was considerably less dependent on type I IFNR expression. Lack of type I IFNR expression by P14 T cells did not affect cell division after LCMV infection but interfered with clonal expansion. Thus, direct type I IFN signaling is essential for CD8 T cell survival in certain viral infections. Type I IFN are produced by host cells early after infection. Although many cell types are capable of producing type I IFN in vitro, plasmacytoid dendritic cells (DC)3 are known to produce high amounts of this cytokine in vivo (1, 2). More than 10 IFN-α genes and one IFN-β gene have been described, both in humans and in mice, and all signal via a heterodimeric receptor, composed of an α-chain (IFNAR1) and a β-chain (IFNAR2). Type I IFN activate macrophages and NK cells and induce a variety of target genes that exhibit immediate antiviral activity (3, 4, 5). The immunomodulatory role of type I IFN has recently received considerable attention. Several reports demonstrated an effect of type I IFN on Ag presentation by DC (3, 6, 7) and on bystander proliferation of CD8 T cells (8, 9). In contrast, type I IFN also exhibit antiproliferative effects on T cells and promote T cell attrition (10, 11, 12). In addition, type I IFN negatively regulate CD8 T cell responses via IL-10-producing regulatory T cells (13). However, evidence for a direct effect of type I IFN on T cells has emerged only from in vitro studies with contrasting results. For example, type I IFN inhibited in vitro proliferation of naive T cells, whereas preactivated T cells were resistant to the antiproliferative activity of type I IFN (11, 14). Moreover, although it was reported that TCR-triggered proliferation of T cells pre-exposed to type I IFN was reduced (12), type I IFN on the other hand enhanced CD8 T cell proliferation (15, 16, 17). Furthermore, activated T cells survived better when exposed to type I IFN (18, 19, 20), but type I IFN also could sensitize T cells for activation-induced cell death (AICD) (21). The role of type I IFN in T cells in vivo has so far only been analyzed in models in which a direct effect of type I IFN was difficult to distinguish from indirect effects mediated by other cell types, such as APC and NK cells (3, 6, 7, 22). Type I IFNR-deficient mice (IFNAR−/−) are highly susceptible to viral infection, and LCMV infection of IFNAR−/− mice leads to T cell exhaustion by AICD and virus persistence. Therefore, it was not possible to determine whether exhaustive CD8 T cell differentiation was due to the lack of type I IFNR on T cells or to the exacerbated Ag load as a result of overwhelming virus replication (4, 5, 23). To circumvent this problem, we adoptively transferred LCMV glycoprotein epitope gp33–41-specific P14 TCR transgenic T cells that were deficient in type I IFNR (P14.IFNAR−/−) into wild-type (wt) B6-recipient mice and followed their proliferative response after viral infection in comparison to wt P14 T cells. C57BL/6J (B6) mice were obtained from Harlan Winkelmann. IFNR α-deficient IFNAR−/− (B6.129S7-Ifnar1tm1Agt) mice (4) backcrossed 10 times on B6.Thy1.2 and P14 TCR transgenic (B6.D2-Tg(TcrLCMV)327Sdz/JDvsJ) mice on a B6.Thy1.1 background were used. P14.IFNAR+/− and P14.IFNAR−/− mice on a B6.Thy1.1 background were generated by breeding. Mice were kept under specific pathogen-free conditions and used at 8–16 wk of age. LCMV strain WE and recombinant vaccinia virus expressing LCMV glycoprotein (rVVGP) were grown on L929 or BSC-1 cells, respectively. Mice were infected with either 200 PFU of LCMV or 2 × 106 PFU rVVGP or rVVM2 i.v. Spleen cells from P14.IFNAR+/− or P14.IFNAR−/− mice (B6.Thy1.1 background) containing 105 P14 TCR+ T cells were adoptively transferred (i.v.) into B6.Thy1.2 mice and infected with LCMV, rVVGP, or rVVM2 on the same day. Lymphocytes and PBL were resuspended in FACS buffer (PBS containing 2% FCS, 0.1% NaN3, and 10 U/ml heparin for PBL) at a concentration of 106 cells/ml and stained at 4°C for 30 min in 100 μl of Ab working solution. Before analysis of PBL, RBC were lysed using FACS lysing solution (BD Pharmingen). The following mAb specific for CD8 (clone53-6.7), Thy1.1 (clone OX7), CD62L (clone MEL14), KLRG1 (clone 2F1), and CD44 (clone IM7) were used. All mAb were purchased from BD Pharmingen. H-2Db MHC class I tetramers complexed with streptavidin-PE and containing the LCMV GP33 peptide were prepared according to standard protocol. For intracellular IFN-γ staining, 2 × 106 responder splenocytes were stimulated with 10−7 M GP33 peptide for 5 h at 37°C in 24-well plates in the presence of brefeldin A. Thereafter splenocytes were surface-stained with anti-Thy1.1 mAb and anti-CD8 mAb, followed by intracellular staining with anti-IFN-γ mAb (clone XMG1.2) using the Cytofix/Cytoperm kit (BD Pharmingen). Splenocytes from P14.IFNAR+/− or P14.IFNAR−/− were washed twice in serum-free medium, followed by incubation with 0.5 μM CFSE for 10 min at 37°C. Labeling of cells was stopped by adding FCS and washing three times with IMDM 5% FCS. Labeled splenocytes containing 2.5 × 106 P14.IFNAR+/− or P14.IFNAR−/− T cells were adoptively transferred into B6.Thy1.2 mice that had been infected with 2 × 104 PFU LCMV 24 h earlier. Thy1.1+ P14 T cells (105) from either P14.IFNAR+/− mice with intact type I IFN signaling or from P14.IFNAR−/− mice deficient in type I IFNR were transferred into B6 mice, followed by LCMV infection. Donor cells were traced in recipients using anti-Thy1.1 mAb and GP33-tetramer as markers for P14 TCR transgenic T cells. As shown in Fig. 1⇓, A and B, after LCMV infection P14.IFNAR+/− T cells expanded vigorously in the blood, reaching a peak by day 8. Thereafter, P14.IFNAR+/− T cells declined to stationary levels, where they comprised ∼25% of total CD8 T cells by day 40. In contrast, P14.IFNAR−/− T cells exhibited drastically reduced expansion. At day 8, frequencies of P14.IFNAR−/− T cells were reduced by a factor of ∼30 when compared with P14.IFNAR+/− T cells. Nevertheless, some P14.IFNAR−/− memory T cells survived and were still detectable 40 days after infection, albeit at lower frequencies. Similar differences in expansion of P14.IFNAR+/− and P14.IFNAR−/− T cells were observed in spleen and inguinal lymph nodes (Fig. 1⇓C). In absolute cell numbers, P14.IFNAR+/− T cells expanded in the spleen from ∼2 × 104 cells before infection to ∼3 × 107 cells 1 wk after infection. Compared with the >1000-fold increase in P14.IFNAR+/− T cells, P14.IFNAR−/− T cells only expanded by a factor of ∼100 during this period. Interestingly, enhanced levels of endogenous GP33-specific CD8 T cells (GP33-tetramer+, Thy1.1−) were detected in mice receiving the P14.IFNAR−/− splenocytes, presumably as compensation for diminished expansion of P14.IFNAR−/− T cells (Fig. 1⇓D). After reaching the peak of expansion, P14.IFNAR+/− and P14.IFNAR−/− T cell populations underwent drastic contraction (10- to 20-fold) and differentiated into memory cells. Both P14.IFNAR+/− and P14.IFNAR−/− memory T cell populations were maintained over time, although at different frequencies, indicating that direct type I IFN signaling was not critical for survival of resting memory T cells. Comparable results were obtained when cells from inguinal lymph nodes were analyzed. This demonstrates that the reduced number of P14.IFNAR−/− T cells in spleen and blood was not due to homing of these cells into other lymphoid organs. It should be noted that surviving P14.IFNAR−/− memory T cells were not tolerant because they could produce IFN-γ after restimulation in vitro and expanded upon retransfer followed by rVVGP infection in vivo (data not shown). These data indicate that Ag-specific CD8 T cells lacking type I IFNR were strongly impaired in their proliferative capacity after LCMV infection. Thus, direct type I IFN signaling to CD8 T cells appears to be critical during the expansion phase of T cells after viral stimulation. 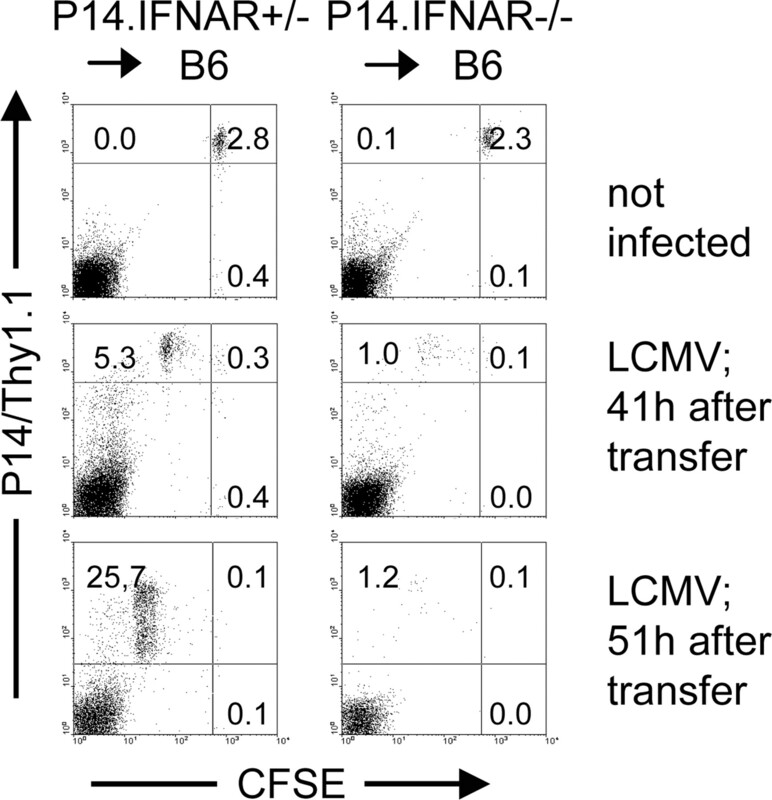 Impaired expansion of P14.IFNAR−/− T cells after LCMV infection.Thy1.1+ P14 T cells from either P14.IFNAR+/− or P14.IFNAR−/− mice were transferred into B6 mice (Thy1.2+), followed by LCMV infection the same day. A, Donor P14.IFNAR+/− and P14.IFNAR−/− T cells were analyzed on gated CD8 T cells in PBL, 8 days after infection by staining for GP33-tetramer+/Thy1.1+ cells. B, Kinetics of P14.IFNAR+/− (•) and P14.IFNAR−/− T cells (○) gated on CD8 T cells in the blood. C, Absolute numbers of P14.IFNAR+/− (▪) and P14.IFNAR−/− T cells (□) recovered from spleen and inguinal lymph nodes at the time points indicated. D, Absolute numbers of endogenous GP33-specific T cells after P14.IFNAR+/− (▪) or P14.IFNAR−/− T cell (□) transfer. To test whether P14.IFNAR−/− T cells are generally impaired in their capacity to expand after Ag-specific stimulation in vivo, we used the same adoptive transfer system as above but infected the recipients with recombinant vaccinia virus expressing LCMV glycoprotein (rVVGP). Surprisingly, both P14.IFNAR+/− and P14.IFNAR−/− T cells proliferated vigorously after rVVGP infection (Fig. 2⇓, A and B). P14 T cell expansion peaked in the blood by day 5, and the frequencies of P14.IFNAR−/− T cells in PBL were reduced only ∼2-fold when compared with P14.IFNAR+/− T cells. Thereafter, both T cell populations declined and generated stabile memory pools of comparable size. This finding excludes the possibility that the lack of P14.IFNR−/− T cell expansion after LCMV infection was due to rejection of the transferred P14 T cells in recipient mice. In absolute cell numbers, P14.IFNAR+/− and P14.IFNAR−/− T cells expanded in the spleen and inguinal lymph nodes to a similar extent (Fig. 2⇓C). As a consequence, endogenous GP33-specific CD8 T cells (GP33-tetramer+, Thy1.1−) expanded to comparable low levels in both experimental groups (Fig. 2⇓D). Six weeks after rVVGP infection, memory P14.IFNAR+/− and P14.IFNAR−/− T cells were detectable in the spleens at high frequencies; such frequencies were observed after LCMV infection only for P14.IFNAR+/− T cells. Thus, CD8 T cells lacking type I IFNR are not inherently impaired in their capacity to proliferate after antigenic stimulation. Expansion of P14.IFNAR−/− T cells after rVVGP infection. Thy1.1+ P14 T cells from either P14.IFNAR+/− or P14.IFNAR−/− mice were transferred into B6 mice (Thy1.2+), followed by infection with rVVGP the same day. A, Donor P14.IFNAR+/− and P14.IFNAR−/− T cells were analyzed on gated CD8 T cells in PBL 5 days after infection by staining for GP33-tetramer+/Thy1.1+ cells. B, Kinetics of P14.IFNAR+/− (•) and P14.IFNAR−/− T cells (○) gated on CD8 T cells in the blood. C, Absolute numbers of P14.IFNAR+/− (▪) and P14.IFNAR−/− T cells (□) recovered from spleen and inguinal lymph nodes at the indicated time points. D, Absolute numbers of endogenous GP33-specific T cells after P14.IFNAR+/− (▪) or P14.IFNAR−/− T cell (□) transfer. To analyze whether impaired expansion of P14.IFNAR−/− T cells after LCMV infection was related to differences in expression of activation markers, CD62L, KLRG1, and CD44 were stained on P14.IFNAR+/− and P14.IFNAR−/− T cells. Eight days after LCMV infection, both P14.IFNAR+/− and P14.IFNAR−/− T cells exhibited a pronounced down-regulation of CD62L on 80–85% of Thy1.1+ P14 T cells (Fig. 3⇓A, top panels). KLRG1 and CD44 were up-regulated similarly on both P14 T cell populations (Fig. 3⇓A, middle and bottom panels). This analysis revealed that, although only a small population of P14.IFNAR−/− T cells was detectable 8 days after LCMV infection, they were indistinguishable from P14.IFNAR+/− T cells with respect to the expression of activation markers examined. Activation markers expression and effector function of P14.IFNAR+/− and P14.IFNAR−/− T cells. Thy1.1+ P14 T cells from either P14.IFNAR+/− or P14.IFNAR−/− mice were transferred into B6 mice (Thy1.2+), followed by LCMV or rVVGP infection. A, Donor P14.IFNAR+/− (left panels) and P14.IFNAR−/− T cells (middle panels) were analyzed for expression of the activation markers CD62L, KLRG1, and CD44 on gated CD8 T cells in the spleen 8 days after LCMV infection. Percentages of activation marker-positive P14.IFNAR+/− (▪) and P14.IFNAR−/− T cells (□) of total P14 T cells are indicated (right panels). B, Donor P14.IFNAR+/− (left panels) and P14.IFNAR−/− T cells (middle panels) were analyzed for intracellular IFN-γ production 8 days after LCMV (upper row) or 7 days after rVVGP infection (lower row). Percentages of IFN-γ+ positive P14.IFNAR+/− (▪) and P14.IFNAR−/− T cells (□) of total P14 T cells are indicated (right panels). 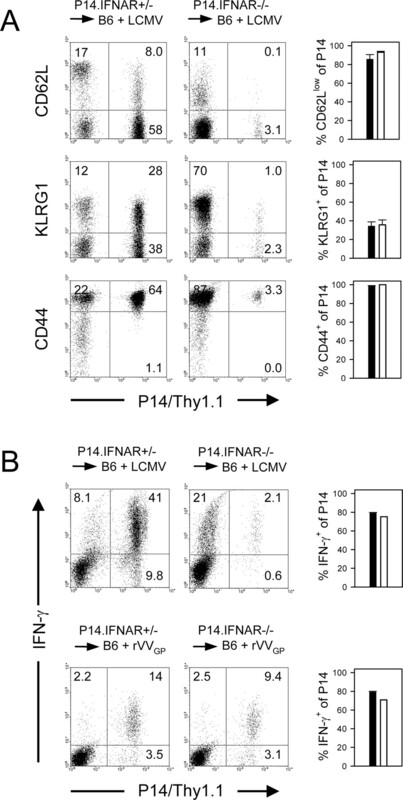 To determine whether donor P14.IFNAR+/− and P14.IFNAR−/− T cells displayed similar effector functions after LCMV (Fig. 3⇑B, top panels) or rVVGP infections (Fig. 3⇑B, bottom panels), cells were stained for intracellular IFN-γ after short-term in vitro restimulation. Similar percentages of IFN-γ-producing P14.IFNAR+/− and P14.IFNAR−/− T cells were detected after LCMV and rVVGP infections. Moreover, P14.IFNAR+/− and P14.IFNAR−/− T cells did not differ in the level of IFN-γ expression after both infections. Thus, lack of type I IFNR on CD8 T cells neither altered expression of activation markers nor influenced the aquisition of effector cell function. Next, we compared the ability of P14.IFNAR+/− and P14.IFNAR−/− T cells to divide early after LCMV infection. For this purpose CFSE-labeled Thy1.1+ P14.IFNAR+/− or P14.IFNAR−/− T cells were transferred into B6 mice that had been infected with LCMV 24 h earlier. Thy1.1+ P14 cells were analyzed 41 and 51 h after transfer in the spleens of recipient mice. Without infection, similar CFSEhigh and Thy1.1+ populations of P14.IFNAR+/− and P14.IFNAR−/− T cells were detected (Fig. 4⇓, top panels). As early as 41 h after transfer into LCMV-infected recipients, both P14.IFNAR+/− and P14.IFNAR−/− T cells had divided as indicated by a reduction in CFSE staining intensities. However, unlike P14.IFNAR+/− T cells, P14.IFNAR−/− T cells were not able to expand (Fig. 4⇓, middle panels). The effect was even more pronounced 51 h after transfer, when P14.IFNAR+/− T cells had proliferated further to represent >25% of gated CD8 T cells, whereas P14.IFNAR−/− T cells had divided but failed to expand and were detectable at levels even below those initially found after transfer (Fig. 4⇓, bottom panels). These results demonstrated that direct type I IFN signaling in CD8 T cells was not essential for induction of T cell division but was crucial for T cell expansion after LCMV infection. Thus, direct type I IFN signaling appears to be required for T cell survival after LCMV infection but plays only a minor role after vaccinia virus infection. In vivo cell division and expansion of P14.IFNAR+/− and P14.IFNAR−/− T cells after LCMV infection. CFSE-labeled P14.IFNAR+/− or P14.IFNAR−/− T cells were transferred into B6 mice (Thy1.2+), which had been infected with 2 × 104 PFU LCMV 24 h earlier. Cell division of P14.IFNAR+/− (left panels) and P14.IFNAR−/− T cells (right panels) was analyzed on gated CD8 T cells 41 and 51 h posttransfer. The finding that P14.IFNAR−/− T cells do not survive after LCMV infection may be explained either by 1) the high Ag load after LCMV as compared with rVVGP infection, resulting in activation induced cell death or 2) by the different local cytokine milieus elicited by the two viruses. To test this, P14.IFNAR−/− T cells were transferred into B6 mice, followed by coinfection with either 1) LCMV and rVVM2, a recombinant vaccinia virus expressing an irrelevant Ag (M2 protein of respiratory syncytial virus) or 2) LCMV and rVVGP. As shown in Fig. 5⇓, expansion of P14.IFNAR−/− T cells was drastically impaired after LCMV but not after rVVGP infection. Under conditions of coinfection with LCMV/rVVM2, P14.IFNAR−/− T cells did not expand. In this experimental setup, P14 T cells were triggered Ag specifically via LCMV-infected APC and could not be rescued by appropriate survival signals from the cytokine milieu elicited by rVVM2 infection (e.g., via IL-12 or IFN-γ). We conclude that cytokines induced by vaccinia virus infection had no protective effect on T cells lacking type I IFNR. Interestingly, no expansion of P14.IFNAR−/− T cells was observed after coinfection with LCMV/rVVGP, indicating a dominant-negative effect of LCMV infection on the proliferative capacity of P14.IFNAR−/− T cells. Thus, the finding that P14.IFNAR−/− T cells do not survive after infection with LCMV could be explained by the high Ag load seen after LCMV, but not after vaccinia virus infection, leading to overstimulation of T cells in the absence of type I IFNR. Confronted with high amounts of Ag, LCMV-specific T cells may only survive if they receive a signal delivered by type I IFNR. T cells lacking type I IFNR undergo AICD, a phenomenon only seen with wt T cells after high-dose LCMV infection. On the other hand, factors may be produced during LCMV infection that have a suppressive effect on T cell proliferation in the absence of type I IFN signaling. LCMV infection suppresses expansion of P14.IFNAR−/− T cells. P14.IFNAR−/− T cells were transferred into B6 mice, followed by infection with LCMV or rVVGP or a combination of LCMV and rVVM2 or LCMV and rVVGP. Donor P14.IFNAR−/− T cells were analyzed on gated CD8 T cells in PBL 14 days after infection by staining for GP33-tetramer+/Thy1.1+ cells. In conclusion, this study shows that type I IFN act directly on T cells in vivo. T cells lacking type I IFNR are strongly impaired in their proliferative capacity after LCMV infection. Direct type I IFN signaling was not important for initial T cell division but critical for T cell expansion and therefore may be required for T cell survival. After submission of our manuscript, Kolumam et al. (2005, J. Exp. Med. 202: 637–650) reported that type I IFNs act directly on CD8 T cells during LCMV infection. We thank Drs. H. Pircher and S. Batsford for comments on the manuscript and Theresa Treuer, Rainer Bronner, and Thomas Imhof for animal husbandry. ↵1 This work was supported by European Community Grant QLK2-CT-2001-02103 (to U.K.). ↵3 Abbreviations used in this paper: DC, dendritic cell; AICD, activation-induced cell death; IFNAR, type I IFNR; LCMV, lymphocytic choriomeningitis virus; rVVGP, recombinant vaccinia virus expressing LCMV glycoprotein; wt, wild type. Cella, M., D. Jarrossay, F. Facchetti, O. Alebardi, H. Nakajima, A. Lanzavecchia, M. Colonna. 1999. Plasmacytoid monocytes migrate to inflamed lymph nodes and produce large amounts of type I interferon. Nat. Med. 5: 919-923. Biron, C. A.. 2001. Interferons α and β as immune regulators—a new look. Immunity 14: 661-664.
van den Broek, M. F., U. Muller, S. Huang, R. M. Zinkernagel, M. Aguet. 1995. Immune defence in mice lacking type I and/or type II interferon receptors. Immunol. Rev. 148: 5-18. Le Bon, A., N. Etchart, C. Rossmann, M. Ashton, S. Hou, D. Gewert, P. Borrow, D. F. Tough. 2003. Cross-priming of CD8+ T cells stimulated by virus-induced type I interferon. Nat. Immunol. 4: 1009-1015. Luft, T., K. C. Pang, E. Thomas, P. Hertzog, D. N. Hart, J. Trapani, J. Cebon. 1998. Type I IFNs enhance the terminal differentiation of dendritic cells. J. Immunol. 161: 1947-1953. Tough, D. F., P. Borrow, J. Sprent. 1996. Induction of bystander T cell proliferation by viruses and type I interferon in vivo. Science 272: 1947-1950. Zhang, X., S. Sun, I. Hwang, D. F. Tough, J. Sprent. 1998. Potent and selective stimulation of memory-phenotype CD8+ T cells in vivo by IL-15. Immunity 8: 591-599. McNally, J. M., C. C. Zarozinski, M. Y. Lin, M. A. Brehm, H. D. Chen, R. M. Welsh. 2001. Attrition of bystander CD8 T cells during virus-induced T cell and interferon responses. J. Virol. 75: 5965-5976. Petricoin, E. F., 3rd, S. Ito, B. L. Williams, S. Audet, L. F. Stancato, A. Gamero, K. Clouse, P. Grimley, A. Weiss, J. Beeler, et al 1997. Antiproliferative action of interferon α requires components of T cell receptor signalling. Nature 390: 629-632. Sun, S., X. Zhang, D. F. Tough, J. Sprent. 1998. Type I interferon-mediated stimulation of T cells by CpG DNA. J. Exp. Med. 188: 2335-2342. Dikopoulos, N., A. Bertoletti, A. Kroger, H. Hauser, R. Schirmbeck, J. Reimann. 2005. Type I IFN negatively regulates CD8+ T cell responses through IL-10-producing CD4+ T regulatory 1 cells. J. Immunol. 174: 99-109. Dondi, E., L. Rogge, G. Lutfalla, G. Uze, S. Pellegrini. 2003. Down-modulation of responses to type I IFN upon T cell activation. J. Immunol. 170: 749-756. Curtsinger, J. M., J. O. Valenzuela, P. Agarwal, D. Lins, M. F. Mescher. 2005. Type I IFNs provide a third signal to CD8 T cells to stimulate clonal expansion and differentiation. J. Immunol. 174: 4465-4469. Feng, H., D. Zhang, D. Palliser, P. Zhu, S. Cai, A. Schlesinger, L. Maliszewski, J. Lieberman. 2005. Listeria-infected myeloid dendritic cells produce IFN-β, priming T cell activation. J. Immunol. 175: 421-432. Ogasawara, K., S. Hida, Y. Weng, A. Saiura, K. Sato, H. Takayanagi, S. Sakaguchi, T. Yokochi, T. Kodama, M. Naitoh, et al 2002. Requirement of the IFN-α/β-induced CXCR3 chemokine signalling for CD8+ T cell activation. Genes Cells 7: 309-320. Lombardi, G., P. J. Dunne, D. Scheel-Toellner, T. Sanyal, D. Pilling, L. S. Taams, P. Life, J. M. Lord, M. Salmon, A. N. Akbar. 2000. Type 1 IFN maintains the survival of anergic CD4+ T cells. J. Immunol. 165: 3782-3789. Marrack, P., J. Kappler, T. Mitchell. 1999. Type I interferons keep activated T cells alive. J. Exp. Med. 189: 521-530. Pilling, D., A. N. Akbar, J. Girdlestone, C. H. Orteu, N. J. Borthwick, N. Amft, D. Scheel-Toellner, C. D. Buckley, M. Salmon. 1999. Interferon β mediates stromal cell rescue of T cells from apoptosis. Eur. J. Immunol. 29: 1041-1050. Kaser, A., S. Nagata, H. Tilg. 1999. Interferon α augments activation-induced T cell death by up-regulation of Fas (CD95/APO-1) and Fas ligand expression. Cytokine 11: 736-743. Dunn, G. P., A. T. Bruce, K. C. Sheehan, V. Shankaran, R. Uppaluri, J. D. Bui, M. S. Diamond, C. M. Koebel, C. Arthur, J. M. White, R. D. Schreiber. 2005. A critical function for type I interferons in cancer immunoediting. Nat. Immunol. 6: 722-729. Ou, R., S. Zhou, L. Huang, D. Moskophidis. 2001. Critical role for α/β and γ interferons in persistence of lymphocytic choriomeningitis virus by clonal exhaustion of cytotoxic T cells. J. Virol. 75: 8407-8423.